Astronomical Classic Slot Review - Casino Answers! 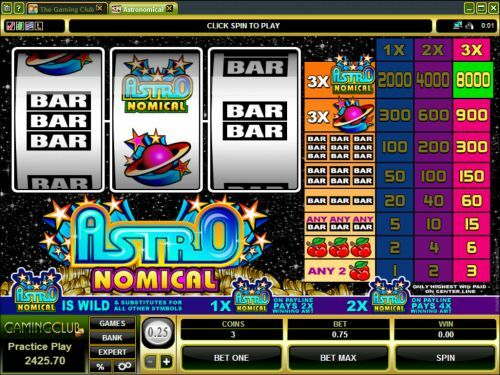 Astronomical is a 3-reel, 1-line classic slot machine developed by Microgaming, featuring a wild symbol and multipliers. You can play the Astronomical classic slot machine at Bovada. Bets on the Astronomical slot machine are $0.25, $0.50, $1, $2 and $5. You can bet 1-3 coins on the Astronomical slot game. Bets range from a quarter up to $15 per spin. Astronomical has a decent betting range, suitable for most slots players. To play the Astronomical slot machine, select your bet and press the “Spin” button. For those looking to play all three coins, you can also use the “Bet Max” button to spin the reels. The Astronomical symbol is the top paying symbol on Astronomical Slots. If you land 3 of these symbols on the payline, you will win up to 8000 coins for the top jackpot. The Astronomical symbol is wild and will substitute for the other symbols in the slot game. Also, when one or two symbols substitute in a winning combination, it will act as a 2X or 4X multiplier. The next best symbol in Astronomical is the Planet symbol, which can pay up to 900 coins. Win Astronomical winnings when you play the Astronomical slot game at Bovada! There are 8 winning combinations on the Astronomical classic slot machine. The complete payout schedule is as follows (1/2/3 coin payouts in parenthesis): 2 Cherry symbols (1/2/3), 3 Cherry symbols (2/4/6), 3 of any Bar symbols (5/10/15), 3 Single Bar symbols (20/40/60), 3 Double Bar symbols (50/100/150), 3 Triple Bar symbols (100/200/300), 3 Planet symbols (300/600/900) and 3 Astronomical symbols (2000/4000/8000). To access the Astronomical autoplay feature, hit “Expert” and you can play 5 or 10 autoplay spins or hit the “Auto Play” button to open up advanced settings. You can set the number of spins (5, 10, 25, 50, 100, 250 and 500), number of seconds between spins (0, 0.25, 0.50, 0.80 and 1.50), stop once all spins are complete, stop when jackpot is won, stop if a win exceeds or equals ($25, $50, $100, $250, $500, $1000 and $2500), stop on any win and stop if credits increase/decrease by ($25, $50, $100, $250, $500, $1000 and $2500). You can stop autoplay at any time. Astronomical has a good theme with sort of an 80’s style of it, making it look unique. The payouts are good – in specific, the 8000 coin top jackpot is excellent for a classic slot. Also, it has a wild multiplier symbol, so that makes it even better. To play the Astronomical slot game, sign up today at Bovada! Are players in the USA able to play the Astronomical online slot? No, American players cannot play the Astronomical slot machine for real money at this time. We recommend that you try out the great USA-friendly slots at Bovada. Where can I read more sci-fi and space slot reviews? If you’re a sci-fi geek, you will enjoy the many sci-fi slots found at online casinos. To read the sci-fi slot reviews, we have a list of sci-fi slots that are available to play. Where can I find a flash game of the Astronomical reel slot machine? You can find a flash version of Astronomical on page 7 at the Bovada Instant Play casino. You can play for free or for real money. If you have any problems with the flash casino, we recommend that you try installing the most recent version of Adobe Flash Player.